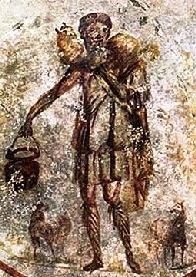 Jesus as the Good Shepherd, Mid 3rd Century, Ceiling, Catacombs of San Callisto, Rome, Italy. Just as letters and numbers are symbols which let us communicate about ideas. Religious traditions around the world have developed languages of symbols and colors which allow persons who are not traditionally literate to understand and communicate their faith. In the history of the Church, symbols have been a way to communicate secretly during times of oppression, a way to teach a particular part of the story of salvation, and a way to remember and celebrate a particular aspect of God's love. What little we know of the images used by early Christians is what we can deduce from the use of images in the catacombs as decorations on their tombs. Many of the early images were borrowed from pagan symbolism to communicate an idea within Christian theology. Much as you might borrow a word from another language to express an idea that didn't have an English word. For instance it is not uncommon to find a peacock on an early Christian tomb. We believe that the peacock was used as a symbol of life after death since it was occasionally used as such by pagan artists. In most cases, however, the symbols used by the early church were the same as those used in our worship today. In Christianity, the most common symbol is the cross where Jesus died, but even the cross has several different categories of symbols within it. When the cross is seen in its simplest form it reminds us of the whole work of Jesus in our salvation. It reminds us of his death, the fact that it is empty reminds us of his resurrection, the vertical piece reminds us that Jesus became a bridge between God and humanity, and the horizontal piece reminds us that he links us with all humans in all times and places. 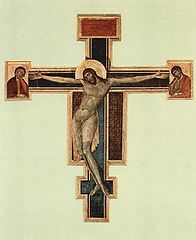 Cimabue, Crucifixion, tempera on wood, 1287-1288, Museo dell' Opera di Santa Croce, Florence, Italy. The crucifix, a cross with Jesus hanging on it near death, reminds us of the suffering Jesus went through for our salvation. It is often used to encourage persons who are facing suffering in their own lives and to remind them that Jesus knows what they are going through. In the United States, Protestants frequently associate the crucifix exclusively with the Roman Catholic branch of the Christian Church. This is, however, an unnecessary and unhelpful distinction. Jesus' triumph over suffering and death should be a source of encouragement for all Christians. Since the days of the early church, artists decorating worship spaces or items to be used in worship use a variety of symbols to depict Jesus. He is depicted as a lamb because of the lamb served at the Passover meal; he is depicted as a fish because the Greek letters for fish (Ιχθυς) could stand for the phrase "Jesus Christ, God's Son, Savior." During the Middle Ages, Christ was frequently depicted as a pelican because of the belief that in times of drought or famine a mother pelican would gash open her chest to feed her chicks with her own blood rather than let them starve. This image was particularly popular in embroidery for altar cloths and vestments to be used at communion. Bartolomeo Montagna, Saint Paul, 1482, Museo Poldi Pezzoli, Milan, Italy. Not quite as common are the symbols that were used to signify the various apostles such as a ring of keys to signify the Apostle Peter or a sword to signify the Apostle Paul. Here are a few of the recognized symbols for early saints. Some of these symbols relate to the saint's actions recorded in Scripture, others are from the stories of their later ministries or the manner of their deaths. Other common symbols are wheat and grapes or a loaf of bread and a cup or chalice. These symbols remind us of celebration of the Lord's Table and the community of faith we recognize and are a part of when we participate in that meal. Also common are depictions of the Church as a boat or ship or as just an anchor since the church carries us across the stormy seas of life. The recognition of liturgical seasons in the church developed gradually around the celebration of Easter and Pentecost. These festivals were related to the Jewish liturgical year since Passover and Pentecost were both Jewish observances. One of the earliest purely Christian celebrations that we would recognize today was of the Epiphany the visit of the magi and the revelation of Jesus to the gentile world. By the Fourth Century we have some mention of a period of fasting before Easter and the recognition of forty days of preparation. The use of colors in the church in a recognized pattern connecting to the liturgical seasons goes back at least to the Thirteenth Century and by some accounts as early as the Fourth Century. During the reformation, our branch of the church gave up the use of most of the ritual and pageantry that had been collected around worship. The Reformers hoped to simplify worship and direct the congregation's attention to the text and the declaration of God's work. During the last century, however, many Protestant churches have begun to return some of the elements like the colors and the seasons to our worship in order to enhance our understanding of the story of God's love through Jesus life and ministry. Advent (the four Sundays before Christmas until Christmas Eve) Blue has come to represent excited preparation and looking forward to the second advent. Christmastide (Christmas Eve until Epiphany January 6th) White or gold represents our celebrating the acts of God in the incarnation and the redemption. Epiphany (January 6th until Ash Wednesday) Green is used to symbolize our spiritual growth during ordinary times. Lent (Ash Wednesday until Easter) Violet or Purple represents our reflection, repentance, and confession as we prepare for the season to come. Eastertide (Easter Sunday until Pentecost) White or gold represents our celebrating the acts of God in the incarnation and the redemption. Pentecost This color reminds the congregation of fire—the symbol of the Holy Spirit. As the color of the Holy Spirit, red is also appropriate for ordinations. After Pentecost (The time after Pentecost until the beginning of Advent) Green is used to symbolize our spiritual growth during ordinary times. The seal of the Presbyterian Church (U.S.A.) is a symbolic statement of the church's heritage, identity, and mission in contemporary form. Its power depends on both its simplicity and complexity. The dominant structural and theological element in the design is the cross—the universal and most ecumenical symbol of the Christian church. The cross represents the incarnate love of God in Jesus Christ, and his passion and resurrection. Because of its association with Presbyterian history, the Celtic cross was chosen as a model for this contemporary rendering of the ancient symbol. Integrated into the lower part of the design are flames which form an implied triangle, a traditional symbol of the Trinity. The flames themselves convey a double meaning: a symbol of revelation in the Old Testament when God spoke to Moses from the burning bush, and a suggestion of the beginning of the Christian church when Christ manifested himself to his apostles at Pentecost and charged them to be messengers of the good news of God's love. The triangle also suggests the nature of Presbyterian government, with its concern for balance and order, dividing authority between clergy and elders and among different governing bodies. This understanding of the church was based in part on an important idea in Reformed theology, the covenant, which God establishes with people to affirm God's enduring love and to call us to faith and obedience to Jesus Christ. In the shape of the descending dove, one can discern the form of a fish, an early-Christian sign for Christ, recalling his ministry to those who hunger. In the lower central part of the image of the cross one can find a baptismal font or a communion chalice (cup) both images of the sacraments we recognize as our ongoing sign and symbol of God's presence with us and working through us.